…had its inaugural meeting this morning at eleven a.m.
Chris Hill picked me up from bike champ Helen Findlay‘s “Eden Burrow”. Not only did Helen (Kiwi transplant) welcome an Imperfect Stranger to her abode, she has trusted me (notoriously hamhanded with tools, equipment, fine china) with her blue & silver Dreichcycle. Chris deftly swopped the brake cables to keep me from killing myself grabbing the right brake lever (British standard: front brake lever on right), and now I am cranking like mad to keep up. Hill’s a lanky titan on a teeny wheeled Moulton loathe to let anyone pass, so me and his aid-de-camp Darren Mirfield gamely keep up, dodging the (ten-points if you miss ’em) snails easing across the Innocent bike path. These two are letting me sit in on a pilot project putting significantly senior citizens back on their bikes. Chris got me over for the Edinbike film fest, and he knows I hate being the Ordinary Tourist. Then at last, a red mini-bus pulls in, and fourteen silverhaired scots tumble out, every imaginable size and shape. Mostly women, and all talkative. Chris gives them a quick rundown of the morning: tea first, then look at bikes, touch the bikes and get on the bikes and maybe even ride the bikes. Or think about trikes. No sooner has tea been passed around than a woman (Jean, the one person who NEVER EVER ONCE rode a bike) bursts into song: Daisy daisy….you know the one. About looking sweet on the seat of a bicycle built for two. Surprise: everyone sings along! I KNOW I am not in Kansas anymore. By the end of the morning there have been two thrilling spills (both harmless) each of which deeply drives home the importance of gardening gloves, anything at all on the hands, for someone getting re-acquainted with the bike. I run around. Darren runs around. We teach, and Val too has come to teach. 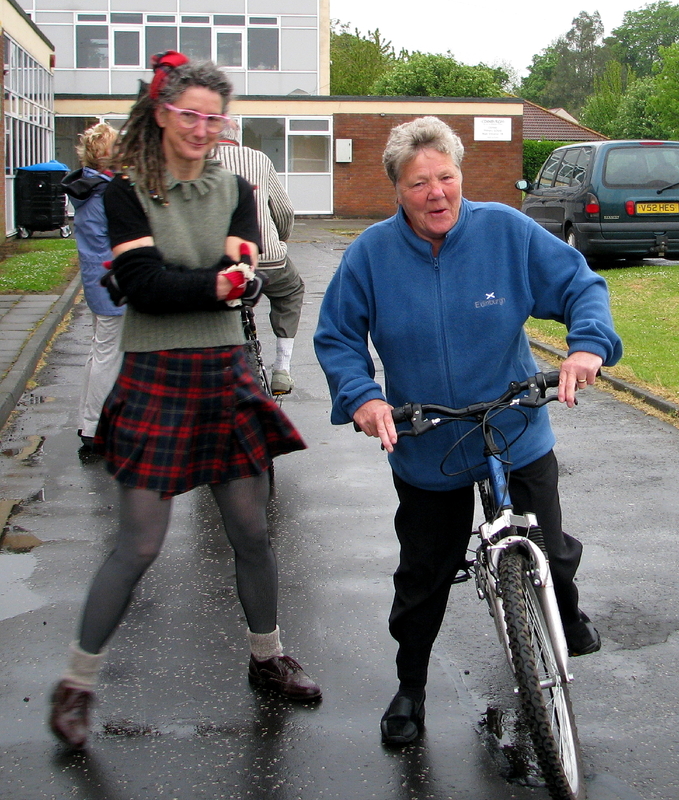 She is likely to be dedicated volunteer for this project….Chris wrenches on bikes and issues wry commentary. Everyone has great time. The upshot: they came just to see if they COULD actually still ride. They found four teachers that managed to get it across that this is possible, even if not in seven day’s time. And next week most of them will come back. Their mission: find the other pedal, learn to stop as well as start, figure out what balance is when you’re rolling along, and give the old freedom machine another try. ~ by jacquiephelan on May 28, 2008. Jacquie, that is some cool outfit you are wearing there….. Something out of an AC/DC album. I hope you rock it when you are back in Fairfax, it is a classic. Now that looks like fun! Glad to hear you’re enjoying your trip. We miss you!